Some primary reasons for forming NSCFPD were to be able to have more funds for replacing aging or unsafe fire apparatus, and the freedom to make our own decisions regarding apparatus acquisition. In our first 26 months of existence were were able to address our three most urgent apparatus needs. First we replaced the district's first-out most-used rescue vehicle with a new one, custom-built to meet the needs of our department. That's Rescue 4433, which was built by Rosenbauer in South Dakota. Besides giving us a newer and more reliable first-out vehicle, we were able to keep the prior first-out rescue, 4432, for response by volunteers from the North Station. We should be able to get a few more years out of 4432, as well as having it as a backup when 4433 is being serviced. The new 4433 went into service in July 2017. 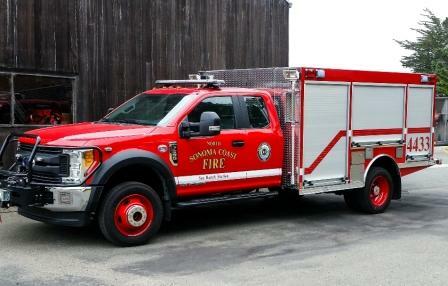 Next we tackled the problem of the aging equipment that had been issued to the Annapolis VFC by Sonoma County. In particular we had a water tender (4496) and a type 3 engine (4477) which were both quite old and also manual transmission vehicles, which cut down on how many department members could drive them. The tender was really a converted water truck with a low GPM pump. We were able to purchase a used water tender from Forestville which is also rather "mature" (1986), but still low-mileage and much more capable than 4496. The "new" tender, 4490, has automatic transmission, a large pump, and also a small compliment of hose so that it is actually a "tactical tender", meaning that it can help to fight fire in addition to simply carrying water. We knew it needed some repair but were able to purchase it for a very low price. The happy story about 4490 is that we bought it in September of 2017, and it went to the CAL FIRE maintenance shop in early October for inspection and servicing before getting its needed tranmission replacement and being put into service for NSC. It was there on October 8 when the October firestorm broke out and, like every other piece of equipment in the county that could function, it was utilized by CAL FIRE for several days on the Tubbs Fire. The consequence of that was that the rental fee from CAL FIRE for the use of the tender paid for both the purchase price of the tender and its new transmission! NSC ended up with a good tender which should now serve us for quite a few years, at almost no cost. Next we turned our attention to 4477. We had been hoping to be able to design and build a new "type 6" engine to replace it. A "type 6" engine is basically a heavy-duty pickup truck chassis with a water tank, pump, and hose, plus a small compliment of rescue and medical gear. Type 6's are especially useful for quick first-attack on wildland fires in areas where larger vehicles may not be able to get access. A type 6 is the ideal vehicle for initial response in most of our District, east and uphill of Highway 1, where most roads are narrow, windy and steep and many are unpaved. In order to be able to have a vehicle in service for the 2018 fire season we shifted our focus to finding a good used type 6, and were able to find and purchase one from the Lake Shastina Fire Department. 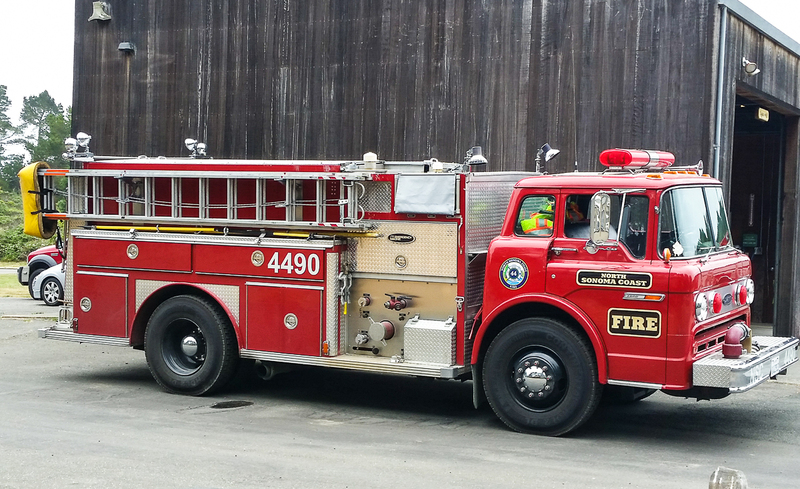 This vehicle just arrived in mid-June 2018 and is now in service as engine 4457. Both 4490 and 4457 are small enough to be able to negotiate the roads in the Annapolis area. The addition of these vehicles has greatly increased our response capability both in our own District and when providing mutual aid to our neighboring agencies. Our next project is designing and purchasing a replacement for what is now our oldest engine, 4483. 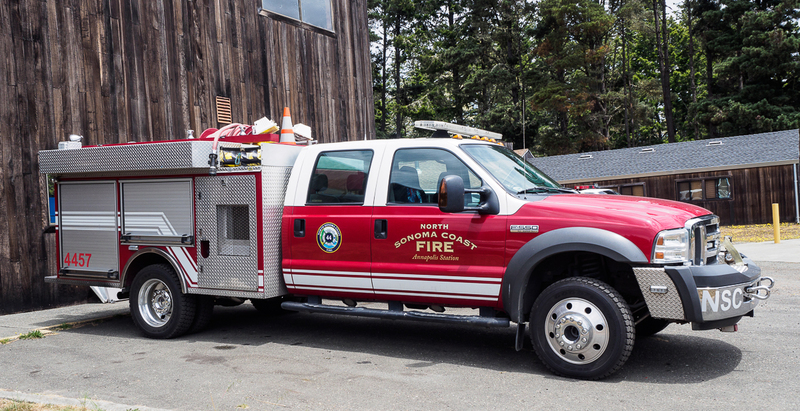 4483 is a 1990 vehicle that was purchased new for The Sea Ranch Volunteer Fire Department. 4483 is a "type 1" engine, equipped for fighting structure fires and staying on paved roads (though 4483 has been modified to be able to provide some wildland capability). The engine is still in service and functioning well but no longer meets national safety standards for fire engines and is not suitable for participating in strike teams or rental to CAL FIRE on large incidents. The District has been working on specifications for a replacement that provides the capabilities of a type 1 but can also respond to wildland fires, and is not too large to be able to get around on our roads. We anticipate finalizing those specifications and ordering the engine this summer, and having the replacement in service by the summer of 2019. We are proud of our making our fleet safer and improving our response capability. Having met our most urgent apparatus needs, we look forward to implementing a long-range apparatus replacement plan that will keep the District strong and replace vehicles appropriately before they become unsafe or obsolete.